CLICK (OR TOUCH) TABLE HEADER COLUMNS TO SORT BY ASCENDING OR DESCENDING ORDER. 1 let-myet-si1 is a carpal bone that protrudes out at the wrist which connects to the little finger through metacarpal bone and also connects to the ulna bone at one side. A-hsit youn2 nay2-deare2 My joints are swollen. A-theare3 kweare3 ba2 byi2 My heart is broken! Bite keare2 nay2 deare2 I have a bloated feeling. Bite na2 deare2 I have a stomach ache. Chay2-dout nyoun3 deare2 My legs are tired! Choun3-hso3 nay2 deare2 I have a cough. Du3 youn2 nay2-deare2 My knees are swollen. Goun3 ay3 ay3 neare1 sin3-sa3 ba2 Think over with cool head. Goun3 kite deare2 I have a headache. Goun3 ma2 deare2 He is stubborn. Goun3 mu3 deare2 I feel dizzy. Goun3 pfyi3 meare2 I will comb hair. hna2-yay2 yo2 nay2 deare2 I have a running nose. Kha3 nyoun3 deare2 I have a back pain. ko2-woon2 shi1 deare2 I am/she is pregnant. Let nyoun3 byi2 My hands are tired already! Let tweare3 pyi3 shout ja1 ba2 zo1 Let's walk hand in hand. Let tweare3 pyi3 shout ja1 meare2 We will hold hand and walk. Myet-hna2 ngeare2 deare2 Feeling looked down. Myet-hna2 pyet deare2 Reputation is ruined. Nyoun3 deare2 I feel tired. Pa3 cha1 pay3 meare2 I will give you a slap. Pfya3 nay2 deare2 I have a fever/ flu. Sha2 shay2 lite da2 He is long-winded. Un2 nay2 deare2 I am vomiting. woon3 shau3 nay2 deare2 I have diarrhoea. Yin2-but na2 deare2 I have a chest pain. Yin2 na2 deare2 I feel hurt! Za1-bin2 hnyut chin2 deare2 I want a hair cut. Let's make learning Burmese language fun and interesting. 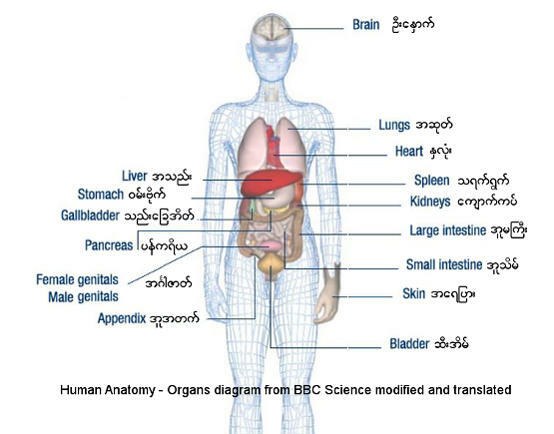 In this lesson, I will describe physical body parts in Myanmar, and what to do with them. For example, when I think of "hand", the old Beatles song "I wanna hold your hand" came up to my mind. How would you say that phrase in Burmese? 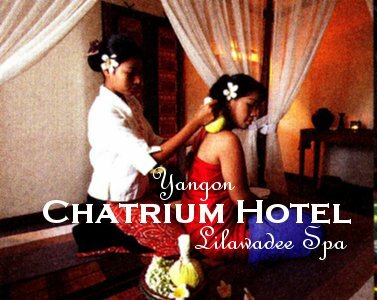 I will cover the common Myanmar Language usages associated with each body part, as well as illnesses and medical terms to be used when you see a doctor. Let's start systematically from the top down. Burmese word for head is goun3. goun3 ay3-ay3 neare1 sin3-sa3 ba2 -- That's the advice to think over something with cool head. Here's the break-down. ay3-ay3 -- cooly. Note: when you double up the word ay3 which means "cool", the word becomes an adverb "cooly". Myanmar Grammar Notes: words such as goun3-kite and goun3-mu3 are verbs. They are compound words with the noun goun3 meaning head. za1-bin2 hnyut chin2 deare2 -- I want a hair cut. How would you pronounce hnyut? It's like saying "no" in Russian: "Nyet". But try saying that with both your nostrils closed by squeezing your nose with your thumb and index finger. pa3 cha1 pay3 meare2 -- I'll give you a slap. In one website, a Canadian woman who travels extensively in Myanmar (without any companion or guide) had learned to say a phrase quite similar to this. She mentioned that if local punks harass her by saying "pretty lady, pretty lady", that phrase will come in handy. myet-hna2 pyet deare2 -- Reputation is ruined! myet-hna2 ngeare2 deare2 -- "feel small" is the feeling you have when other people look down on you, have low opinion of you, and or make disparaging remarks about you, your family or your country. The truth could be real or imagined. Myanmar Grammar Notes: Both myet-hna2 pyet and myet-hna2 ngeare2 are verbs. They are compound words with the noun myet-hna2 meaning face. sha2-shay2 lite da2 -- means the person is so long-winded. That person talks and talks and talks and talks. byi2 -- has reached a certain state or condition. The video clip below describes how Myanmar girls are afraid of broken liver. Myanmar Grammar Notes: This is just like in English where heart as a noun can be used as broken-hearted as a verb. hna1-lone3 tha3 -- heart that feels. This is a modern Burmese word which gets the idea of Heart from English. I have covered in that Burmese song not to break the hna1-lone3 tha3. yau3-ga2 means disease. Both active and passive smoking can cause a-hsoat yau3-ga2 -- lung disease. If your diet is high in cholesterol, trans fat and saturated fats, and if you don't exercise regularly, you may want to check whether you have hna1-lone3 yau3-ga2 (heart disease). hsi3 cho2 yau3-ga2 shi1 deare2 -- I have diabetes. HIV/AIDS is recognized by the Ministry of Health as a major social and health issue. The highest infection rates are in those regions bordering Thailand and China. According to WHO report , in 2010 HIV/AIDS was responsible for 1% of cause of deaths in children under 5 (which could be the result of mother-to-child infection). ko2-woon2 shi1 deare2 -- (She is / I am) pregnant. Use the words nay2 deare2 for short-term symptoms like flu, fever, cough, cold, vomit, running nose, swollen glands, and so on. pfya3 nay2 deare2 -- general term which means [I/he/she has/have] fever and flu-like symptoms. choun3-hso3 nay2 deare2 -- Use this phrase if you have a cough: I have a cough. un2 nay2 deare2 -- I am vomiting. A-hsit is a singular form of a muscle joint. If you want to stress that several joints are swollen, you can use the plural word a-hsit dway2. 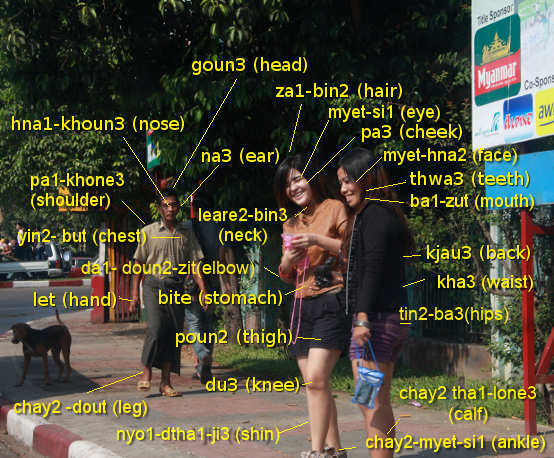 The complete word for stomach in written Burmese is woon3 bite. In spoken language, this word is shortened as bite. bite na2 deare2 -- I have a stomach ache. woon3-shau3 nay2 deare2 -- I have a diarrhoea. bite-keare2 nay2 deare2 -- Use this phrase if you have a bloated feeling in the stomach due to indigestion. How would you say, "I want to hold your hand"? The phrase doesn't sound natural in Burmese unless you hold hands (with your girlfriend, for example) and walk together instead of just sit there. ja1 -- plural to imply "we"
let tweare3 pyi3 shout ja1 meare2 -- We will hold hands and walk. Modify that phrase a bit, and it becomes a good one for politicians asking people to join hands with them. kha3 nyoun3 deare2 -- I have a back pain. It's interesting that kha3 refers to the waist, but that phrase can be used for the muscle sore from the waist up instead of the word for the "back", which is kjau3. You can use the word chay2-dout for your leg from toe to thigh. chay2-dout nyoun3 deare2 -- My legs are tired! byi2 -- has reached certain state or condition. Yes, I am very, very tired. I am going to forget about my endless long days and exhausting late nights for a while. Hope you heart is lightened and refreshed by this video clip as it did to me.